Compared are the two different Director's Cuts. In a postapocalyptic world, bounty hunter Gibson and young woman Nady are searching Pearl. Pearl is a cyborg and she possesses information about technical innovations and she is supposed to get that information to Atlanta. But Pearl gets abducted by Fender and his posse who are now facing a fierce opponent: Gibson. For those who want more details about the history of the Director's Cut of Slinger, I recommend the intro of the comparison between the Theatrical Version and the Director's Cut . The short version: in 2011, Albert Pyun got his hands on a workprint of Cyborg, edited by himself back in the days. Meanwhile, this Director's Cut has been released in Germany - as "Slinger" (a previous title for Cyborg). 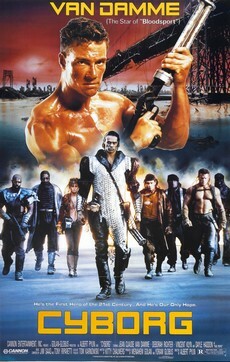 That Slinger Blu-ray contains the unedited Director's Cut Albert Pyun distributed by himself on the internet, a hybrid of the Theatrical Version and the Director's Cut (basically, this is the Cyborg Theatrical Version plus the added scenes from the Director's Cut even though the order of events matches the Director's Cut - please see the comparison "Theatrical Version vs. Director's Cut for more details) and last but least, there is a third version of the Director's Cut (probably an older one) which contains two alternate scenes. Unfortunately, that Director's Cut only contains the director's commentary, no English audio is available for this version. The order of events is the same in both versions. The following comparison is about the Unedited Version of the Slinger Blu-ray and the Director's Commentary Version on the bonus DVD. The BD contains a longer shot of the girl. The DVD contains a bloody close-up instead. No cut on the BD plus Gibson longer with the boy. 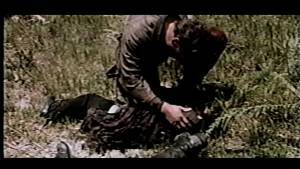 The DVD shows the boy's bloody wound instead.